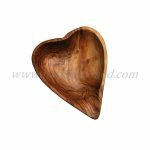 This beautiful olive wood heart shaped board makes the perfect gift. Measuring 8.5″ across at its widest point and 0.5″ thick. 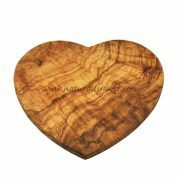 This board is perfect to use as a wooden cutting board, cheese board, or to serve a romantic breakfast on! Olive wood is a very hygienic wood and won't score much with cutting on. 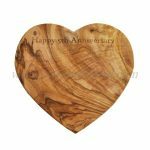 Cared for properly this olive wood heart board will last a lifetime. This olive wood board is made from a single piece of wood. All of Naturally Med's olive wood products come with care instructions so that the recipient knows how to best look after their items. Naturally Med also offer an engraving service so you can personalize this heart board too. Don’t forget to check out Naturally Med’s full range of olive wood cutting boards – available in many shapes, sizes and styles.